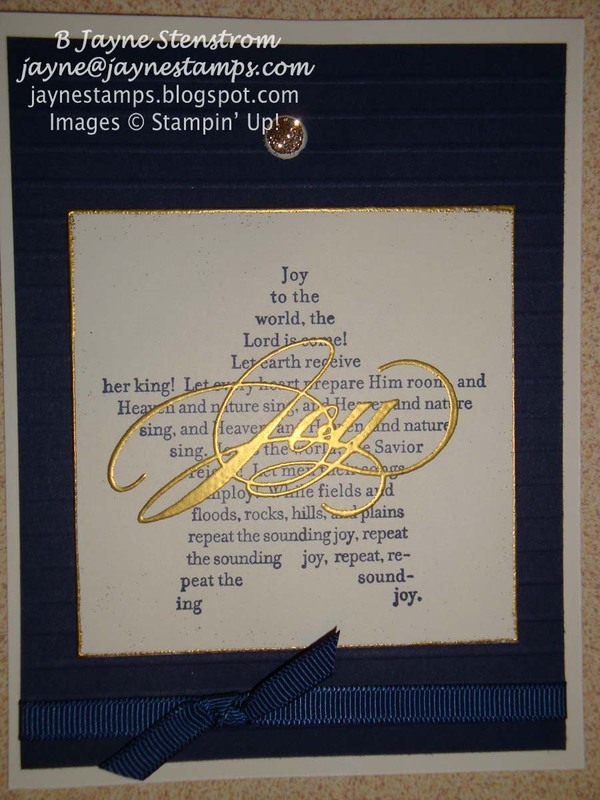 There is a beautiful and elegant stamp set in the Holiday Mini Catalog called The Sounding Joy. I just love the elegance of the script writing and the words that are used. If you like a classic look to your Christmas cards, this is the stamp set for you! This card was made by Joann Anglin. 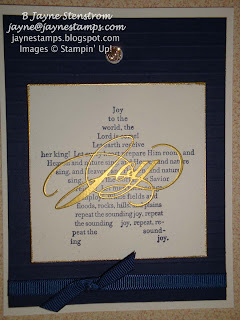 She used Night of Navy and Whisper White cardstock along with Night of Navy dye ink and VersaMark with Gold Stampin' Emboss Powder. She also used the Stripes Textured Impressions Embossing Folder. Doesn't the word "Joy" just pop right off at you? Did you notice the extra touches she added? They don't take much time, but add to the overall elegance of the card. The edges of the top Whisper White panel were inked with VersaMark and then embossed with the Gold emboss powder. And she also tied some Night of Navy 1/4" Grosgrain Ribbon across the Night of Navy panel at the bottom. Sometimes if you have a card that you're not quite sure looks "done", try either adding some ribbon or sponging the edges. It's amazing what a difference that can make! I'm Gently Falling... for a free Big Shot?